Each morning was the same, she awoke and noted no change in the landscape. Now, everyone knows that wandering warrior princesses are prone to being impatient and easily bored; so, in a blink she instead became preoccupied with feeding an Otherworld maelstrom. The kind to swirl a girl until she slipped Reality. But time grinds ever forward and schedules must be kept. The mornings kept coming and she began to detect only but an odd sensation of something approaching; nothing definable. Like a whiff of rain on the wind. But where and what was it? 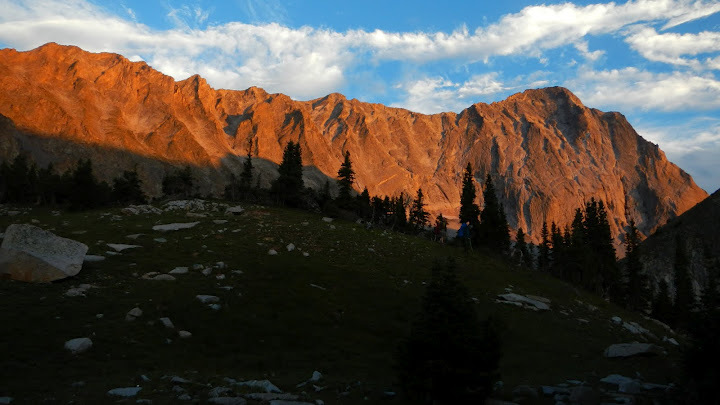 A recent conquest of the mighty Capitol Peak, one of Colorado’s ‘most challenging’ 14ers had left a sediment of immortality in her. A dangerous magic, she knew, by the very nature of its allure. Humility and humanity keep a warrior’s compass True; without them, one becomes a rogue. Condemned to hunt without purpose, eventually lost to the Dead Marshes. These thoughts were quickly cast aside when the Bugle of her Homeland sounded. Returning to the flatlands, she just missed most of the Clans, though the Vikings had not yet lifted oar and set sail north. The cause of commotion in the Homeland was that Little Sister and Tim had returned from their ventures to the Far Reaches of the globe for an interim visit. Home for a short span, kin and kind had come from all corners to aprovechar de este oportunidad. For one precious day the nuclear Hughes Family were reunited. It took some 45 minutes for them to return to a collective brand of most awesomely normal weird. Public tours of such lofty establishments as the aquarium, Plaza, Church of Resurrection, and local Sonic were balanced by mega cuddle fests, off-brand yoga parties, and a great surfeit of feasting within their castle walls. Here our Warrior listened and asked. She soon came to appreciate that in any vibrant community change and growth are a most treasured and life-long pursuit. We steadily learn and prepare while Opportunity moves to its own rhythm. There is naught but to be open for it. Gathering amoung most trusted Counselors and confidants, she presented quandaries and triumphs. Both were met with an undeserved degree of assurance and affirmation. Women as wise and kind as these. Well. They are exceptional. She returned to the Mountain Realm, edified. Another morning came, right on time, like those so many previous. Today, however, she finally realized the terrain HAD changed! With focus centered inward she had missed the land folding up tall and steep. The climb had been gradual but suddenly all about stretched daunting tracts of fields and peaks of Opportunity. Challenges and Chances. And here she was, straddling a Knife’s Edge. Wearing wings of imaginary immortality. Parfait must be the best dessert on the planet!